all the way to Luna's Shadow (WP11). Note that the Mapping Survey will last 2 weeks. There will be no scheduled meetup for the weekend of April 12th - April 14th. Arrive at WP11 for the weekend beginning 19th April. survey are therefore encouraged to spread out and explore the neighbouring regions. locations as the organisation team will be taking a break during the weekend of April 12th-14th. Stage 3: Mapping the Aphelion. one of DW2's lasting legacies. required... 2 weeks between the scheduled waypoint meetups. Stage 1: Laying the foundations for Galactic Core scientific studies, revisiting mysteries of the past, and trailblazing the new age of discovery. Stage 4: A journey across the Abyss... and beyond. Anyone who went on Distant Worlds 3302 knows this well. Crossing it is one of the most arduous journeys many of us have ever taken - that humanity has ever taken. When we did it the first time, everything was all new, we were young and inexperienced, but we found our way, and made it to the otherside without getting lost. We found something new on our journey, a new way to look at the galaxy, a new way to cross it, to travel as a team, to take working together to a whole new level. To continue in this Distant Worlds tradition, we need to find something new this time too. Distant Worlds 2 is an expedition to the far outer rim, culminating at Beagle Point around 16-18 weeks after departure. 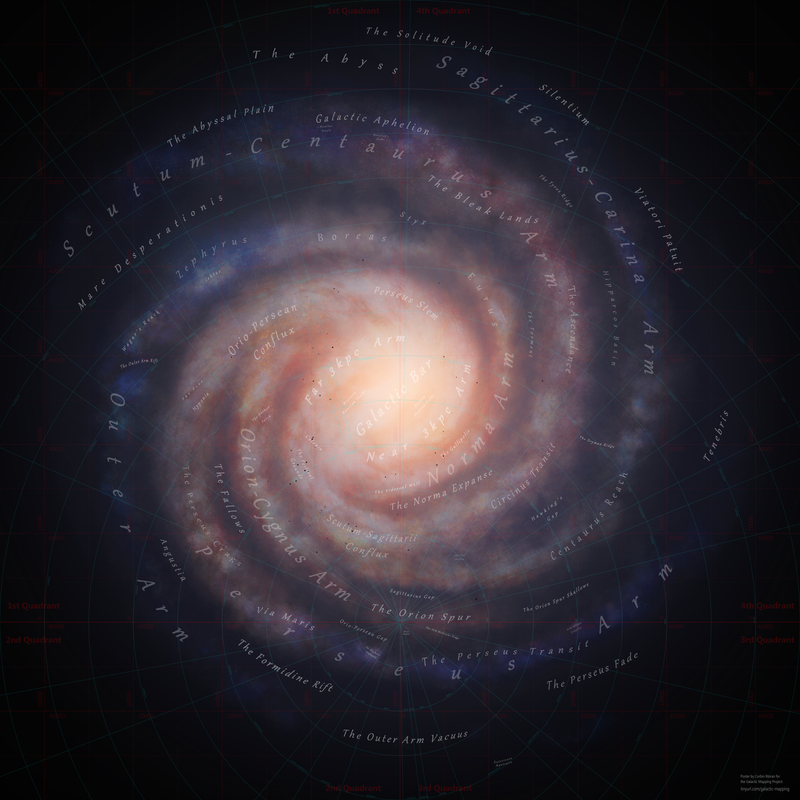 Its mission statement is to take thousands of CMDRs on a journey of discovery, to see what mysteries the galaxy contains, finally unlocked for all with the new scanners and Codex to guide us. For those new to mass expedition events, the basic premise is that fleet members will travel the route at their own pace, either alone, with friends, or in wings, and will regroup at designated waypoints along the journey. These waypoint gatherings will begin on a Friday and end on a Sunday. There will be around 12-15 Waypoints to visit along the designated route (this may be subject to change). Over a 'Waypoint Weekend' there will be all sorts of events and projects to take part in. Participation in events and projects is 100% voluntary. What is new to all players in this mass expedition is the focus on Discovery - the journey to each waypoint will be its own mini expedition, with the goal being for people to see if they can uncover any of the anomalies and mysteries of the galaxy, and submit them for the sake of the whole expedition. We will then organise meetups to view and study the findings along the way! The expedition is going to be composed of several thousand commanders, and therefore several thousand play-styles. Our goal as organisers is to accommodate as many play-styles as possible. The general ethos will be one of freedom and diversity. You will be able to take part to whatever extent you like, and we hope there will be plenty of activities and goals on offer for you to take your pick. There will be events, meetups, competitions, missions, games, and much more, all within the framework of the journey, and with the overarching theme of discovery. In order to keep the fleet as a fleet, and the expedition as an expedition, efforts will be made to keep things structured. Waypoints will be revealed only when it is time to head toward them, and CMDRs who rush on ahead will be removing themselves from the fleet, and therefore this is discouraged. There will be plenty to do and see between waypoint meetups. The average waypoint to waypoint distance is around 5,000 Light Years, therefore as a rough guide, a travel time requirement of around 2 hours spread over 5 days for a 45 LY ranged ship (the current fleet average) will be required. Revealing the route in stages will help encourage the early emphasis of the DW2 expedition to lean toward a more thorough and slower-paced attitude to exploration and discovery during our journey into the new unknown. This will take the fleet from the bubble, out to the near edge of the Conflux where our first mining-based community goal will take place. Once complete, we'll continue to explore the mysteries of the Conflux and visit some of the locations of lore. We'll be relatively close to some outposts so those new to long distance events will have ample opportunity to regularly cash in their exploration data, stop for repairs, and have a chance to refit or rethink their ships and loadouts before the expedition turns coreward and leaves all remnants of human infrastructure far behind. The main goal of this stage though will be to complete the 2nd phase of the community goal at the very heart of the galaxy, after which the fleet will continue to explore the core, and gradually make its way out toward the far side, visiting at least three more waypoints beyond Sag-A* before we begin stage 3. Fleet attrition will most likely begin to bite during this stage, as was the case with DW1, many commanders see Sagittarius A* as an adequate goal in which to call it a day - and this is perfectly fine - DW2 will be no different! This stage will test the endurance of even the most die hard explorers in the fleet. The Aphelion regions are a vast stretch of the galaxy that little is known about, with few points of interest to break up the monotony of the hyperspace grind. It is here were fleet attrition will be at its highest. The mapping event is designed to give participants goals to achieve, as well as providing a wealth of new information and interesting POIs for the Galactic Mapping Project - a goal that will benefit explorers and expeditions that traverse this region long after DW2 is over. A successful mapping event of the Aphelion will be one of DW2's lasting legacies. Stage 3 will be one of the longest stretches between waypoints, in excess of 12,000 LYs between meetups, but players will have a longer time period to travel the distances required... 2 weeks between the scheduled waypoint meetups. The final stage of DW2 will begin around 13,000 LYs from our final goal (similar to how the final leg was structured on DW1), and it will include our journey out of the Aphelion, across the Abyss, and on to the far outer rim where Beagle Point is located. As was the case on DW1, stage 4 is the longest and loneliest stretch by design, as unlike the earlier part of the journey that encouraged social interaction and meetups along the way, this final part is something we try to encourage commanders to do at their own pace, often alone, and with no pressure to rush to meet a WP deadline. This is to try and recapture the feelings of solitude and remoteness that the first lone pioneers out here experienced during the early days of deep space exploration. However, and as always, it is entirely up to the individual to chose how 'quickly' they want to expedience the final leg of DW2, but note that the expedition officially ends for you, the participant, the moment you reach Beagle Point and post your arrival date, roster number, & screenshot to the arrivals thread (that thread will go up around the last week of April). It is expected that the remaining fleet members will be stretched out across tens of thousand of light years by the time the trailblazers reach the Abyss, and for this reason we will set a very flexible timescale for participants to reach the final waypoint system (Beagle Point) in order to be officially recognized as completing the expedition. The preliminary cut off date for participants to post their arrival information to the arrivals thread will be June 13th - the 6 month anniversary from our departure from Pallaeni. The industrial aspect to Distant Worlds 2 will call upon the galactic community to help gather the materials to be used in the construction of the science station in the galactic core region, and again to help outfit the station once its deployed. This will come in the form of two mining-based Community Goals. One at Waypoint 2, and one in the Galactic Core itself at Waypoint 7. Successful completion of the second stage will see the deployment of a new Starport in a system neighboring Sagittarius A*. Upon completion of the station, the DW2 fleet will depart the galactic core and continue its journey along the expeditionary route. The Rock Rats will be organising and assisting with the industrial projects. In the spirit of Discovery, if there's anything to be found in the rings, we'll find 'em! Project Details : Will be posted once the Fleet reaches Waypoint 10 (circa April 2019). During the expedition, the best screenshot submissions will be highlighted in the weekly DW2 newsletter. The Logistics Department and role will handle other logistical matters such as winging people in to instances and more. The DW2 Role Play team will also help coordinate and facilitate, as well as act as a hub for any and all role play events associated with Distant Worlds. Please be in touch if you have any proposals. Expeditions, what are they and how do they work? The basic premise behind an expeditionary event is to provide a set of waypoint locations along a pre-defined route, present an itinerary and schedule, and provide a framework for events and activities for participants to get involved in at those waypoint meetups. Waypoints are the gathering points, usually set several thousand light years apart, and often at iconic or interesting locations along the route. It is at these waypoints where the bulk of the participants taking part meet up (usually once per week), as travelling an expeditionary route is on the main a solo or wing pursuit (due to the differing timezones involved or the amount of gametime participants have to commit). There are several key aspects to make an expedition work in a structured and cohesive manner. The objective of an expedition is to take a group of players on a journey of exploration out into the depths. The objectives need to capture the imagination, as well as provide enough gameplay activity for participants to get involved in because such events commit players to spending a considerable part of their gametime far from the inhabited parts of the galaxy. Pacing is a key aspect in so far it has to be set at something that the majority of participants are comfortable with, as well as allowing enough time for them to actually explore or take part in any events or projects associated with that expedition. With current gameplay mechanics, around 4,500 LYs to 6,500 LYs between weekly waypoint meetups seems to be the norm. Trust is the fundamental aspect on which all expeditions work. Without trust among its participants, the social aspects that binds the expedition together and makes the weekly waypoint meetups, events, and projects work, unfortunately breaks down - and it doesn't take much for this to happen. Trust is therefore paramount. Unfortunately there are many pitfalls when trying to be inclusive to everything and everyone on an expedition, as some gameplay styles for events like this simply do not mix with the current game mechanics. The main one of these is that the game modes on offer are polar opposites in so far as one mode (Open Play) is a no rules 'wild west' environment, wholly suited to locations where players can easily get back on their feet after a setback during a PvP encounter, whereas the Private Group mode, which is advocating a purely PvE environment, has rules to adhere to precisely to prevent the kind of gameplay seen in Open which can quickly undermine the fundamental aspects of long distance & long duration events. There is no middle-ground in Elite Dangerous at the moment, and as a consequence this polarizes the community. Deep space expeditions are a unique event in the world of Elite. They're unique in a sense that players taking part in them risk far more than any other play style in Elite, precisely because of the practicalities involved. An expedition commits a player to spending months of their gameplay far from any re-spawn points, and takes them to locations that often take weeks or months to reach, and occasionally physically difficult to reach too due to the jump distances involved (eg. DW2 will include several such locations along its route! ), and as such the emphasis is invariably put on jump range and exploration-based loadouts as to make participation viable for many commanders who have limited gametime to keep pace or who want to visit some of the extremely hard to reach locations on and expedition that only a purely stripped down exploration build is capable of reaching. Defensive set-ups should never be relegated to an afterthought though, and players need to take responsibility on how they're prepping for these kinds of long distance events, far from home, as you never know whats out there! Deep space events are not like running the BGS or bubble-based missions, where death via PvP or NPC encounters can be overcome in minutes, and where the player can get back to doing what they were doing with little upheaval or fuss. Instead death during an encounter on an expedition far out in the depths of space not only means that player losing all the data they amassed along the way, but they're also reset back to a station that can be 10's of thousands of LYs away. Therefore it should come as no surprise that out of the 40 major expeditions in Elite Dangerous that have taken part to date, every single one of them have been primarily aimed at PG gameplay, as this is the only viable way to make them work as intended. Why not create defensive roles? The bottom line is that it is impossible to vette hundreds of players for such roles. Defenders and 'security' role gameplay is futile because you never truly know the motives of the players or groups who take those roles – it only takes a handful to betray their role and use it against those they're tasked to protect - and that alone instantly undermines the whole concept and destroys the trust. Additionally, as it stands, the game itself conspires against this kind of gameplay as it becomes incredibly time consuming and logistically frustrating trying to make it work effectively across many different instances. The role works on paper, but when its applied to any event that has trust as its key foundational aspect, it simply does not work at all because it can be so easily manipulated and undermined. It is an unfortunate fact that until Elite Dangerous has more adequate tools to utilize that will protect the integrity and cohesion of player created events, expeditions like DW2 will always be primarily aimed at those playing in PGs, since PGs are the only means in which organizers can impose strict PvE rules to adhere to, and although not 100% safe, PGs at least give that trust between its participants a chance to flourish. Therefore we encourage participants signing up to DW2 to consider one of the PGs, or starting one of their own, to be their prime mode of play during the journey we're about to embark on. Alternatively use E.D.I.S.O.N. This a fantastic 3rd party program that allows commanders to easily locate surface coordinates. It is very easy to use, simply copy the basecamp coordinates and planetary radius from the waypoint table on Post#2 (below), and paste them into the relevant boxes on the E.D.I.S.O.N. UI. Approach the planet and click on the 'Start Navigation' button. Follow his flight instructions and he will guide you to where the basecamp coords are. I'm unsure as to whether this works in VR or not. E.D.I.S.O.N. was created by CMDR Maxine Slayton <-- download here. Be sure to follow us wherever you prefer, it is an announcement-critical event, with impromptu meetups, discoveries and who knows? A lot of people are asking about squadrons so I am making this post everything squad-related. As I am doing this on xmas eve, it has been hard to get hold of all the relevant squad leads, so some of the info here is incomplete, potentially inaccurate and subject to change. Please check back closer to the time! Squadrons come with pros and cons for an expedition so large that it's worth explaining how we are going to use them. Given that not everyone is going to want to be in an official squadron for the expedition, and that there are too many people to fit into a single squadron anyway, we are having to make sure that nothing squadron-based is mandatory, or required in any way for the experience. That being said, squadron play is something that can add a lot to the expedition so we are indeed going to be making some official squadrons (listed below) across platforms and using them appropriately. Let me stress that nothing that is announced or shared in squadrons, in an official capacity, will be exclusively announced/shared there. Our main announcement platforms are still twitter and discord, as well as this forum thread and our other outlets. Things will get announced in squadrons as well, and bookmarks will be shared, as well as all other squadron related funs. We anticipate the squadrons will form their own sense of togetherness and friendships, their own personalities and may well even compete with one another, in-expedition and as part of the general squadrons competitions. All of the squadrons below will only be for those taking part in the expedition, until the expedition is over. This will be monitored and CMDRs whose names are not found on the roster may be removed. Squad chat will be expected to be of a high standard, and we will retain the liberty to kick anyone from the squad without explanation if we find they are bringing the conversation down with vulgarity, distastefulness, or aggressiveness. We aren't going to be making any hard and fast rules, and each squad will likely develop its own norms, but we expect people to use their heads and be mindful of the fact that there are many hundreds of CMDRs looking for a pleasant, peaceful and enjoyable experience, and we, the organisers, are very committed to providing this to them, over all other considerations. Squad chats for all is restricted to English, unless specified differently below. FleetComm itself is a discord group that was created to host the communications for the original Distant Worlds 3302 expedition and has continued ever since to serve the exploration community as an exploration hub, with over 4000 registered pilots chattering as they explore the galaxy or go on expeditions. FleetComm will be the main comms platform for Distant Worlds 2 of course, and a Squadron with its name will be one of the initial two Squadrons to be "officially" hosting the expedition. Once the expedition is over it is expected to continue, and if spaces are available, it will be opened to anyone. This squadron is the other official PC squadron. It is not designed to continue after the expedition closes, and can thus service pilots who wish to join another squadron after the expedition is over, but during the expedition be part of squadron experience for Distant Worlds 2. This is not to say that it certainly will be closed after the expedition, but we cannot guarantee it will remain open. Once FleetComm and Distant Worlds are full, we will announce another official squadron, and so on until everyone is happy. All squadrons will be considered Official, Important and be treated with the same level of commitment from the organisers. A second squadron with said name and same applies. A third squadron with said name and same applies. A fourth squadron, immensely grateful to have the honoured EDSM collaborating with the expedition and administrating a squadron for us. This squadron will generally be related to EDSM after the expedition. It was around before and will persist after. This squadron is set up by the Geology and Biology department, headed by the lead of the department. It is open to all distant worlds members, especially those with Geology or Biology roles, or those who want to keep up with what this department is doing. This will be for the french speaking community, although english can be spoken in squad. This will be for the german speaking community. EDProfiler is a program I wrote a while ago to help create graphical profiles for the game that can be saved, and selected and applied before starting the game. It has evolved to do many things, including running custom files, changing some of the key .xml graphical settings, having a HUD colour editor that includes avatars and even provides a colour palette and several options to really craft a colour with a goal in mind. The latest tool added to EDProfiler is a Tone Mapping tool that lets you change the tone of the overall game, so you can make it look darker in the sky but brighter in the HUD, for example. It has a preview and lets you see what it will look like and is a really powerful tool for letting you achieve good results. I have also written quite a few other programs for the game that haven't had the same success, so in the end I just incorporated them into EDProfiler so they can be in one place and maintained through that channel. It is a couple of these tools that I believe are actually going to be very useful to CMDRs on the expedition. One of them I am extremely proud of and have put a lot of hard work into, as it really is a useful idea. The first tool is CMDR Logs. This is a tool for note-taking/journal-writing/captain's logging etc, that is designed to do a lot of things automatically, the primary part being that it records the logs by detecting what you type into local chat, so you don't need to alt-tab out of the game to record your thoughts. It will record them for you in the layout below, either under the system you are in, or into a file of your choice (say, if you want all your logs in the same place on an expedition). It will add lots of details from the player journal to describe where you are and what you are doing (supercruise, on a specific planet, docked in a specific station), add times and dates and titles etc. It can also capture screenshots. In case you are worried that it will go mad during DW2 capturing your entire local chat, it can be set to only capture if you prefix a message with the word "LOG". We are considering the idea to hold a competition for the best log, which are all stored in .txt files. Of course, console users can participate too with their own logs; they don't have to be made using the tool. If you are already using EDDiscovery or Captain's Log (which I hope to integrate my tool into with an import one day), those will be fine too. Note: one last important use of the tool, if not for logs, is to act as a bookmark system. Simply take a screenshot and let the tool put it into a file with the system name, and you can then have a bookmark system (which you can, of course, make notes on) with pictures showing why you bookmarked those systems, what they looked like, what awesome things you found there etc. This is a simple tool that deals with in-game chat. It can either pull up a history of all your chat since you enabled logging (and definitely since player journals were added), or it can replicate your in-game chat live. The reason I see this as important for a big expedition is it really helps to share locations, as well as other links and information. Squadrons allow us to share bookmarks within squadrons, but there will be many squads, and some people won't be in squads, so it's still a great tool that lets you highlight and copy whatever's in your chat. So if someone types in a system for you to go visit, or a link to eddb or some other site, you can alt-tab out, go to the tool, and bring it up in a way that can be directly copied for pasting back into the game or into a web browser etc. It is, of course, also a great tool to keep your memories of the expedition, as I am sure everyone will make friends, and have awesome events, and keeping the logs of what was said will bring a smile to your face in a few years' time when reminiscing. It also helps you remember what was said as logs aren't kept indefinitely in game. Lastly, it helps you check if anyone said anything while you were AFK, or anything that generally got missed. As is tradition, official Distant Worlds mugs are available! See below.. If you wish to have a mug with your name and roster number (see below), I have provided a paypal donate button, where you can request this, and after a few days I will add the mug to the store and email you. There may even be some special perks for those in the mug club, like special meetups and a secret newsletter and other fun stuff like that! You'll also find a few other nice things I've designed as official memorabilia: laptop case, phone case, notepads, clock. See images below! CMDR Qohen Leth has laid out and gotten hold of some beautiful sewn Distant Worlds 2 Patches, as is tradition. Big thanks to him! CMDR Starlancer has got production going on the awesome high quality, weighty, awesome DW2 medallions. The image says 3304 but that's old, he will be updating them with 3305. Please make sure to give your CMDR name when buying so it can be engraved on the back! Available in black, red and blue. Once again, where is the sign up list and why is my name not on it? Looks like I'm good to go. Woot! Details have been finally released! So we got a community goal at Sag A*? What about the megaship? Didn't have the time to read all of it yet. I will add to this post that we foresee a lot of good things for mining along the way, even though some of our hopes weren't possible. They may not be what people were expecting and this may mean some people have to sadly change their plans, but we still see mining as being a strong part of the expedition. See the mining section above and await some more details to be revealed as we get closer to the date of departure. If it turns out that after everything some people are still disappointed, then alas, I am so sorry about that. Thankfully, we still have such an amazing expedition with so many ******* outstanding things going on! Let's focus on this positive! Yes! It’s happening! Now I really do need to get my ship ready.